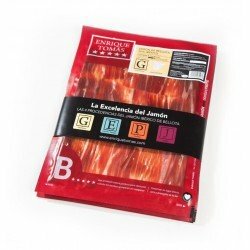 This elegant vacuum-packed sachet contains 80 grams of Jamón cut by our Jamón-experts and comes from a purebred Iberian pig, whose meat has been cured carefully by ham experts who pay extraordinary attention to the ham flavours and aromas. The iberian pigs are fed with acorn during the Montanera. The taste the Aromatic Jamón stands out for being the most elegant and full of nuances. Aromatic Jamón, produced by experienced ham masters, is an unprecedented product from the Iberian Peninsula and a reference point for the production of quality ham. 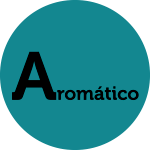 In terms of taste, it is an intense and pleasant Iberian, very tasty beginning and with an elegant note that takes the aromas with it so that no trace remains in the mouth once they have been tasted.